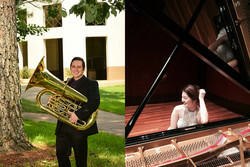 NACOGDOCHES, Texas - The Stephen F. Austin State University School of Music will present a faculty recital featuring Dr. Daniel Chapa, instructor of low brass at SFA, along with collaborative pianist Hyun Ji Oh at 7:30 p.m. Tuesday, Jan. 29, in Cole Concert Hall on the SFA campus. A feature of the Friends of Music Concert Series, the tuba and euphonium recital will include works by Franz Schubert, Felix Mendelssohn and Philip Sparke, among others. The recital is the first of six Chapa will perform this semester at various universities, among them St. Mary's University, University of Texas at San Antonio, Texas State University and Washington State University. Theme and Variations on "Das Wandern" from Die Schöne Müllerin by Schubert features variations composed by Chapa, who will perform on euphonium on this piece. "I composed each variation based on all of the popular theme and variations solos by Jean-Baptiste Arban, Arthur Pryor, Joseph De Luca, and others I had performed throughout my career," Chapa said. "The simple harmonies and melodic line allowed me to focus on creating something that was technically challenging yet very listenable." Mendelssohn's "Songs Without Words" showcases five of the composer's works, which Chapa arranged for euphonium and piano. Each song is about three minutes in length and is in contrasting styles, making them great recital selections, he said. "I first encountered this collection of pieces in one of my music theory classes during my time as a graduate student at the University of North Texas," Chapa said. "After analyzing and listening to the beautiful melodic lines, I also noticed that most of the melodies stayed in the upper voice for the entirety of the song. This type of scoring made the pieces very easy to arrange and a lot of fun to play!" Sparke's "Song for Ina" was originally composed for euphonium solo with brass band, and it has since been arranged for a variety of instrumentations. This particular arrangement is for solo tuba and piano.